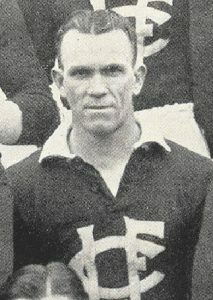 Born in 1903, McAuley joined Launceston from South Launceston in 1924, and was a member of the Blues’ premiership team that season. Over the following decade he forged a fine reputation within the club and competition overall as a tough and courageous defender, as well as an outstanding leader. After serving as vice-captain for a number of seasons, 1933 proved to be a momentous one for both individual and club: coach Keith Roberts stepped down in early August after a personally disappointing season, and McAuley was chosen to coach out the year. Under his leadership, the Blues came from third position at the time of McAuley’s appointment to annex both the NTFA and state titles (defeating City and Cananore respectively), and as a result McAuley was appointed permanent coach for 1934 onwards. Launceston teams during the mid-1930s boasted a number of players who would become legends of the club, including Roy Cooper, ‘Dodger’ Williams, Bill Cahill, Trevor Ranson and Albert Waddle, and under McAuley’s tutelage this group of champions blossomed into one of the most powerful teams to have ever played the game in Tasmania. From 1933 until McAuley’s departure at the end of 1936, Launceston claimed four successive NTFA flags and three State titles from four attempts. Though now firmly in the veteran class as a player, McAuley was a member of four of these triumphs, however a severe knee injury cost him a chance of playing in the 1935 deciders, and by the following season his senior appearances were few. McAuley finally called it quits as both a player and coach with Launceston after the 1936 state final loss to North Hobart, retiring with a glittering CV and a then-club record 203 senior games, in the process becoming the first Launceston player to reach the 200-game milestone. McAuley’s contributions to the Launceston Football Club were much celebrated both during and since his legendary tenure: he was awarded life membership of the club in 1934 and NTFA life membership three years later, while more recently his incredible coaching record led to his being named as coach of the Launceston Team of the Century, where he was also named in a back pocket. Leo McAuley passed away in 1992 at the age of 89.